On June 13, 2011, I presented a podcast for the 365 Days of Astronomy program on galaxy clusters, which are the largest things in the universe bound together by their own gravitation. (Incidentally, a major chapter in my Ph.D. thesis dealt with using clusters for cosmology.) Here is the complete transcript of the program with pictures and a little extra information here and there. (You can also go back to the original supplemental post, which also has some additional information and images.) If you want to listen while reading, here’s the audio file from 365 Days of Astronomy. Betelgeuse is a supergiant star whose outer layers are significantly nonspherical -- gravity isn't strong enough to keep the star in a clean spherical shape. 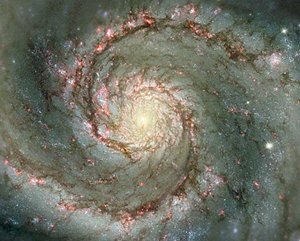 M51, a spiral galaxy. While it isn't identical to the Milky Way, it shares many characteristics. So how big can we go? Gravity is the force that dominates the universe on the largest size scales. Just as gravity holds stars together and holds planets in orbit around the Sun, gravity holds galaxies together, binding large numbers of star systems together with quantities of gas and dust – another mingling of the very large with the very small. In fact, the presence of these very small things helps hold galaxies together: there are simply not enough stars to keep galaxies whole. Even more strikingly, there doesn’t seem to be enough gas either: most of the mass in a galaxy is the mysterious invisible stuff known as dark matter, which is not made of atoms. Our own Milky Way galaxy has around 200 billion stars, but its mass is about a trillion times the mass of our Sun – which means there is about 5 times the amount of dark matter in our galaxy than there is matter made of atoms. Galaxies themselves are not the limit of what gravity can make, however: most galaxies are found in collections known as groups (if the numbers are small) or clusters (for larger numbers). Galaxy clusters are the largest objects in the universe bound by their own gravity, and as such can tell us a lot about the structure and history of the cosmos. The Milky Way is in a small group known creatively as the Local Group, along with Andromeda Galaxy and about 50 smaller galaxies. Galaxy clusters, on the other hand, can have hundreds or thousands of galaxies, masses more than a quadrillion times that of our Sun, and sizes of more than 10 million light-years from one end to the other. Just as galaxies are built of stars, gas, and dark matter, galaxy clusters are comprised of galaxies, gas, and dark matter. The center of the Virgo cluster. Note the giant elliptical galaxy M87 at the center. The closest galaxy cluster to the Milky Way is the Virgo Cluster, about 54 million light-years away. It consists of roughly 2000 galaxies, most of which are small, but several can be seen with a regular telescope, including the giant elliptical galaxy M87. 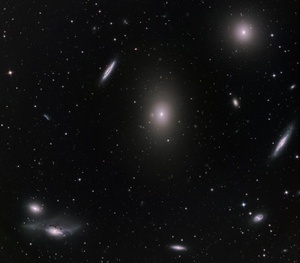 The Virgo cluster’s mass is about 1.5 quadrillion times that of the Sun, based on the motion of galaxies inside the cluster. Virgo has a lot of spiral galaxies, much like our Milky Way, which helps reconstruct its history: spirals have a lot of relatively young stars and often have active star formation, so perhaps Virgo is a relatively young cluster. Other clusters of this type are known as irregular clusters, because they have no well-defined center or clear shape. By contrast, regular clusters have really big galaxies at their hearts, and form a more or less spherical shape under the influence of gravity. An example of a large regular cluster is the Coma Cluster, about 320 million light-years away in the constellation Coma Berenices. 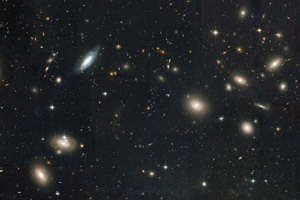 At the center of the clusters are two huge elliptical galaxies (NGC 4874 and NGC 4889, visible with good telescopes) and a number of smaller elliptical galaxies; the spiral galaxies in the cluster mostly lie near the outskirts. In any galaxy cluster, the interaction between galaxies can be very complicated: they pull on each other, changing each other’s shapes, merging to make larger galaxies, and even driving star formation where the raw materials are available. In the same way that stars don’t make up most of the mass of galaxies, only about 5% of the mass of a cluster is in the form of galaxies. The gas lying between the galaxies is about 10% of a cluster’s mass, with the remaining 85% or so consisting of dark matter. 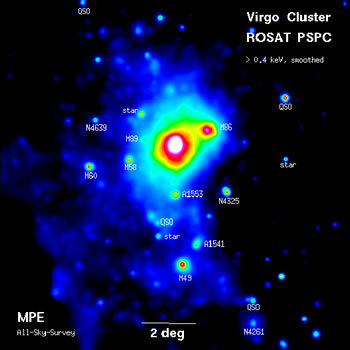 Virgo Cluster in X-rays. Note that the galaxies do show up (mostly because of the giant black hole in the nucleus of each), but they aren't nearly as bright as the gas. The gas between galaxies, known as the intracluster gas, has temperatures between 10 million and 100 million Kelvins (which are actually about the same numbers for Fahrenheit as well). This gas is hot enough for nuclear fusion, but in a cluster it isn’t dense enough for that to happen. Instead, as it zips around, it emits light in the X-ray portion of the spectrum. In visible light, a cluster looks like galaxies; in X-ray light, a cluster looks like a big glowing blob, with the galaxies hardly registering. In fact, to an X-ray astronomer, the cluster is the hot gas – it’s how they find clusters and characterize them. You may recall that temperature is a good proxy for the speed of atoms in a gas: low temperature means slow, high temperature means fast. The incredibly high temperatures of the intracluster gas are probably due to shock waves from the formation of the cluster: clusters are built of smaller structures, so as smaller groups of galaxies merge, they heat up until the gas glows ever more brightly. The total mass of a cluster, with all components included, is determined by measuring the motion of the galaxies: their velocities provide a good guide to the amount of gravity holding the cluster together. The velocities observed are far greater than can be generated by the galaxies and gas alone, so dark matter must account for the remaining mass. As I mentioned earlier, dark matter is not made of atoms, and doesn’t seem to interact with light at all – it is transparent across the entire spectrum. However, it does have gravity, and that’s how we know it exists. In fact, the evidence from galaxy clusters is even stronger than from galaxies, since clusters are less messy from an observational standpoint. The Bullet Cluster is a galaxy cluster in the process of merging. The pink regions are the hot gas as imaged using X-rays; the blue is the dark matter as found using gravitational lensing. Also, as I said in my 365 Days of Astronomy podcast from April 22, the bending of light known as gravitational lensing can help astronomers map where the dark matter is located in at least some instances. 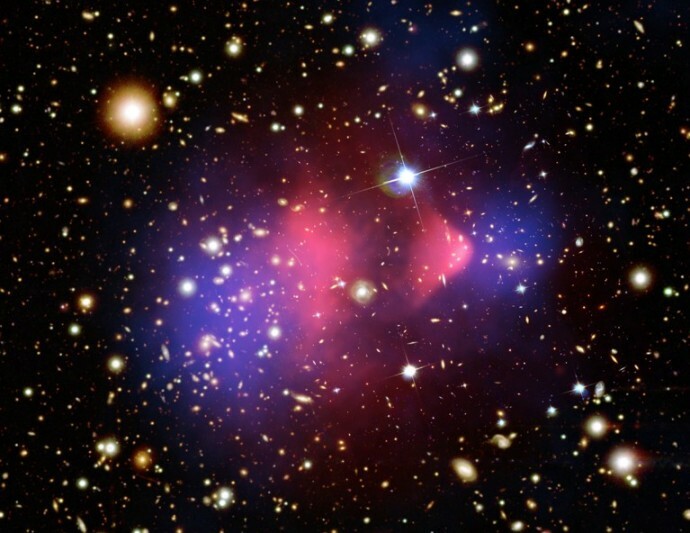 The Bullet Cluster is a famous object believed to be two clusters in the process of merging; the hot gas shows a big shock wave where the clusters collided, and the dark matter can be mapped separately by using the bending of light. Unfortunately, most clusters aren’t going to show such a dramatic separation of the gas and dark matter, but gravitational lensing can still provide a double-check on the mass measured using galaxy velocities. Clusters also can be tools for viewing even more distant objects using gravitational lensing, by enhancing the light from galaxies far beyond them. Abell 1689, one of the most massive galaxy clusters known, was found in 2008 to have magnified the light of one of the earliest galaxies yet discovered. 6 Degree Field galaxy survey (6dFGS) map of 125,071 galaxies in the nearby universe, showing how they are clustered together. When I mentioned earlier that galaxy clusters are the largest objects in the universe, some of you may have been thinking, “Wait, haven’t I heard of superclusters?” In fact, galaxy clusters are the largest objects in the universe bound by their own gravitational attraction. The universe does exhibit structures larger than clusters, but here’s an analogy that might be useful: think of those bracelets made up of magnetic beads. Each pair of beads is held together by magnets, but the force acting between one bead and another farther down the chain is very small. In a similar way, galaxy clusters can chain together into filaments, form giant wall-like structures, and generally form loose affiliations – with vast empty spaces in between. Collectively, these comprise the large-scale structure of the universe, something that looks remarkably like bubbles or neurons in a brain (although obviously the forces involved are very different). Just as stars look small in comparison to the vastness of a galaxy, galaxies and clusters are pinpoints in the hugeness of the universe. However, these pinpoints are the way we understand how the universe evolves, how the action of gravity works over large distances and time scales. Clusters are beautiful objects in their own right, whether you look at them in visible light or X-rays; whether you study them for how they magnify light from more distant objects or for what they can tell us about the existence of dark matter; or if you just enjoy looking at them for their aesthetic properties. Galaxy clusters, the biggest things in the universe bound by gravity, offer a look into things both bigger and smaller than themselves and enrich our understanding of the cosmos.